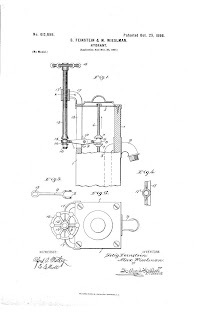 Today I learned my second-great grandfather Selig patented some improvements to fire hydrants back in 1898. I wouldn't normally have searched the patent database for his name, because I wouldn't expect to see anything. I've put some of my more uncommon surnames through it, but I didn't bother with "Feinstein" as I'm not related to most of them. However, today I checked "Google Scholar" for Selig specifically - don't ask me why - and it includes the patent database. His professions during his life included real estate and laundry. Apparently he knew something about fire hydrants, too. A renaissance man. So don't assume your relative didn't patent something. You never know. John, What a wonderful discovery! I'm sure you are most pleased at finding a patent a relative received. Congratulations on your sleuthing! Now what does that gizmo do? Seriously, I hope you get a good enlargement of the drawing and have it framed as a curiosity/conversation piece.